Since its beginning in 1981, the main purpose of the Community Environmental Monitoring Program (CEMP) has been to involve the people from the communities around the Nevada Test Site (NTS) in its off-site monitoring program for radiation. After all, who would you rather ask if it is safe to live in your community, your neighbor who shares your concerns or a stranger who lives elsewhere? When the program started, the stations required weekly visits by Environmental Protection Agency (EPA) personnel to maintain them. Air filter samples, barograph strip charts, and magnetic cassettes used to store data from the background gamma detector were collected. The cassettes could not be downloaded until the EPA technicians were back in the office, meaning that it was often a week or more before the data was reviewed, and results were not available to the public until even later. Thanks to technological advances in data storage and transmission, and the ability to remotely program the instruments, the data from the majority of the CEMP stations is available in near-real time at www.cemp.dri.edu. The NTS is located 65 miles north of Las Vegas and is larger than Rhode Island, so monitoring the off-site area means the CEMP covers quite a bit of ground (29 stations in Nevada, Utah, and California around the NTS). Today, the Desert Research Institute (DRI) of the Nevada System of Higher Education manages the CEMP for the U.S. Department of Energy, National Nuclear Security Administration (DOE\NNSA) Nevada Site Office. In 1999, when DRI began management of the program, a full suite of weather instruments was added to the stations, and the data from them, as well as from the primary background gamma radiation instrument, is stored and transmitted from Campbell CR1000 dataloggers. A variety of methods are used to get the data to the CEMP web page. In the most remote locations, it is transmitted by GOES satellite from which data can be downloaded every hour. In locations with internet access, CEMP uses the Campbell Scientific NL100 interface to transmit data, and there is still one location that uses a Campbell phone modem. The CEMP network relies on fixed stations. But what if you had a temporary data gap to fill, or needed to collect data at a location where a permanent station was not needed? For this, DRI has developed its portable environmental monitoring stations (PEMS). 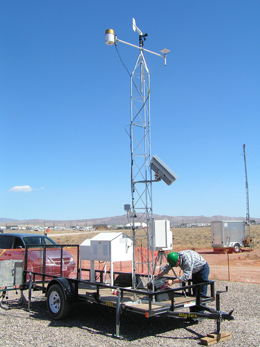 For the DOE\NNSA in Nevada, PEMS have been used for monitoring emissions from a range fire, for testing equipment to measure radon, and for solar-powered air sampling where no line power is available. The PEMS have also been located next to a permanent CEMP station as part of quality assurance to ensure data collection accuracy. DRI came up with the basic design for a PEMS by taking all the equipment one would find at a CEMP station and placing it on a flat-bed trailer. A PEMS can be readied for transport in under an hour and be back in use within an hour of arrival at its next location. Other advantages of placing the equipment on a flat bed are that the equipment maintains the same configuration from location to location and has a relatively small footprint, and that equipment or instruments can be added or taken off as necessary. The configuration of the PEMS is a 15-ft weather tower (which can be laid down on the bed of the trailer for transport) at the front, the meteorological instruments that go on the tower, and a pressurized ion chamber for background gamma detection. All of this is powered by solar panels, with a GOES satellite system for data transmission. Wireless internet, DSL, and phone systems may also be added, but those tend to only be options in populated areas. In keeping with the CEMP station configuration, an air sampler and its enclosure were added to the trailers. But the air sampler requires 120 Vac to operate and, as such, is the limiting factor for remote-area operation. DRI has operated the PEMS in locations without AC power when only meteorological and background gamma radiation instruments that could be powered by small solar panels were needed. To date DRI has built three trailers for four different projects, and they have operated in some extremes in terms of environments, from the low deserts of Tecopa, California (near Death Valley), to the high deserts of central Nevada with elevations over 6,000 ft. Additional instruments used on the PEMs for these projects include radon detectors (including the real-time Alpha Guard™ radon detector), solar-powered air samplers, and dust flux sensors.